The original Roller Coaster Tycoon gave birth to what became the indisputable king of tycoon simulation games. 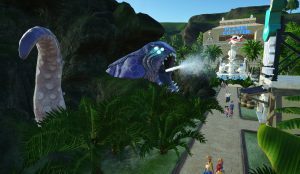 A successor to the previous Roller Coaster Tycoon (3) has long been coming and more than once we’ve been given a new Roller Coaster Tycoon title that isn’t a true follow up to the storied RCT series. RCT 3 hit in late 2004, with a good chunk of additional expansions and extra content following. Since then, we’ve been given nothing but pure garbage pretenders in the form of microtransaction mobile games and a RCT World title that has been a disaster from day 1. I knew, after they’d changed developers twice, it wasn’t going to bode well for a product that was apparently still going to be pushed onto shelves as if it were ready. That was before it changed developers a third time. 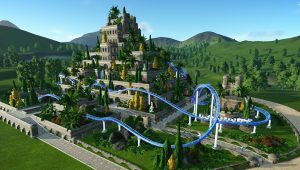 Recently, Atari announced RCT World would not go full release as planned this Spring (which was already a pushed back date from December), but instead Early Access. With it’s struggle, the heir to the throne of tycoon simulator looks ready to die and a new king poised to rise. Years and years ago, I spent an inordinate amount of time playing RCT and honestly, the second and especially the third, wasn’t much different. The series got a little bit cartoony and I didn’t necessarily care for it. It wasn’t as odd as Sim Coaster, but cartoony in the sense that it included a lot of unrealistic rides that didn’t interest me. For that reason I always looked back on the original with great nostalgia. Building coasters and other rides was incredibly simple and fun. Getting riders to ride some of your creations though was something else entirely. So through many years and after the many disappointing iterations of an attempted successor to the RCT throne, I’d almost given up hope. But in a strange twist of fate, in what reminds me of the Sim City debacle, it seems that the heir apparent is about to be stabbed in the back and his claim lost perhaps forever. 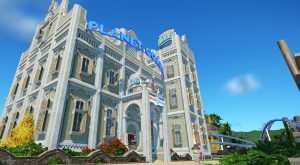 From the respected Frontier developers comes Planet Coaster, who also developed RCT3 and it’s expansions. 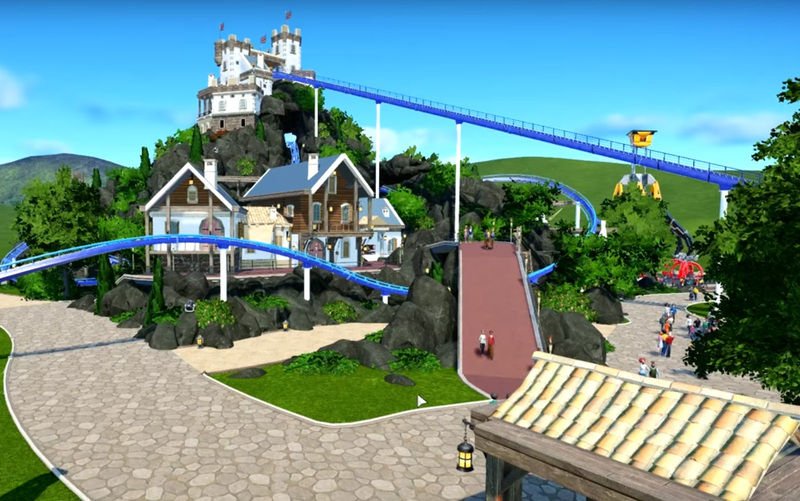 Planet Coaster looks to topple the RCT regime that it’s developers had once helped cement, but can it? Will it fare better than RCT World? I did this preview knowing full well that this game is extremely early access. 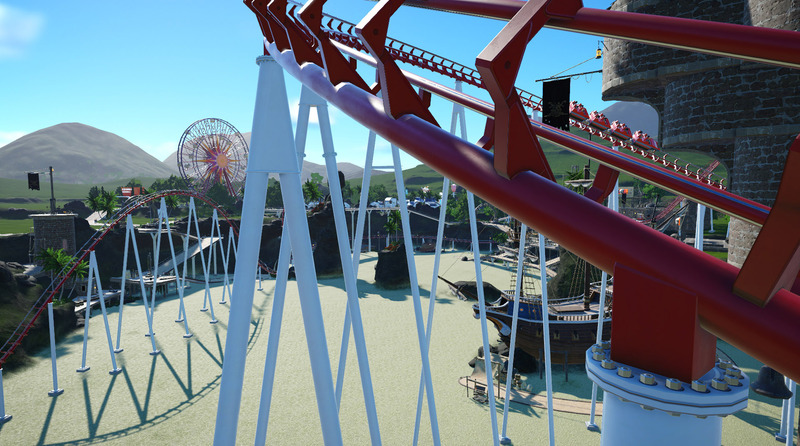 Frontier expects a Q4 release this year with 3 planned stages of early access – 1st stage being scenery and basics, which is already been implemented, a 2nd stage consisting of coaster building and terraforming, and a 3rd adding community functionality. That being said, I wanted to do a preview as it stands right now, and then come back when the game releases and do a full review. Despite being in the very beginning stages, the game is far along. 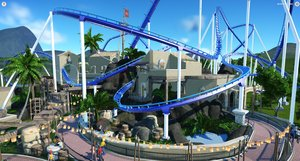 Now don’t get me wrong, it’s not a finished game and in it’s current state, it’s more of a park building sandbox than a coaster tycoon. But as a foundation, it could hardly be stronger and I can’t think of a better way to get early access rolling. I’m counting on it to have an extensive career mode with many challenges as well as a lot of scenarios, both built-in and player-made scenarios. The exclusion of player-made challenges would be a complete shame. Before I go into detail regarding the current state / phase of development, it’s really important to scrutinize what’s there and probably won’t be changing. The game’s engine is developed using Frontier’s own COBRA engine which seems to be extremely robust. Graphically the game is way better than I expected and the level of detail is superb. From a god-like view watching over your park to completely zoomed in, the game hardly breaks immersion and does not sacrifice its looks at all. Even the people in your park were paid close attention to, with fantastic animations and a great level of detail. Frontier has gone to painstaking detail to make rides and attractions realistic, down to the nuts and bolts of each support for each rail of each coaster. Weather, landscapes and other conditions create perfect atmospheres, from a dark night to early morning. Frontier did their homework on rides and have pledged that all the rides you’ll see have real-world equivalents. To my utter happiness, we’ll not see strange fantasy rides in PC. You’ll see this realism translate to really intricate rides that look and behave as you’d expect them to. When you build a roller coaster, not only will the physics work as they should, but you’ll have to build according to the constraints of the given materials. You’ll see supports generate in an authentic way, not simply up and down but supports at angles that you’d see in actual parks. The first phase of EA concentrated on scenery. At it’s core, you’re able to make entire buildings that you can duplicate, move and tweak. These buildings aren’t premade though, as you’re given a wide variety of walls, ceilings, decorations and more to build a completely customizable structure. And when I say customizable, I do mean customizable. The number of things you can do with each piece is staggering, from flipping and rotation to placement inside other objects, you’re limited only to what you can think of. I’d like to see a scaling option here as well similar to what’s in the Sims 4. It would really provide an added depth to your ability to use pieces for other tasks. We might see it in the near future though in another release, so here’s to hoping for that. Regardless the building implementation is extremely powerful and allows for dramatic scenery for simple looks or very functional ride entrances. It remains to be seen though if we’ll get enough themed scenery that hopefully isn’t too genre specific. Right now there’s a decent mix of pirate, castle and futuristic-themed items, along with some other things. Along with scenery and true to the mantra that everything will be realistic and exist somewhere, there’s a handful of props and animtronic people and creatures with surely more to come that should further the experience and immersion. One highlight, the fan-favorite kraken, is a huge servo-driven beast that rises and falls and roars, with separate tentacles that add tremendously to the feel. Paths in-game are a bit wonky to make, I’m not totally sold on the path making tool but I’ve read it will be much improved with subsequent alpha releases so I’m not too worried with that. This phase of development featured limited coaster building thanks to a built-in cheat. The developers weren’t going to include it at all, considering it wasn’t a part of the first phase and it’s clearly not finished yet, but to appease the community they added the ability to unlock the tool. Despite being very unfinished, building one of two types of steel coasters is very fun and easy. There’s still some obvious smaller bugs and some odd tweaks I found with things like track inclination, tilt and various special components like brakes and lift chains but they are very fun to make, realistic, and as you’d expect, completely ridable. At the moment, I’m not entirely impressed (and a bit disappointed) with the way it appears shops/stalls will be implemented. I’ve seen some really cool buildings that mimic restaurants, down to tables and chairs made from a mish mash of miscellaneous items. But that’s all for show, unfortunately, as shops for food and souvenirs will only be little window in a wall. I was (and still am, considering it’s only early access) hoping for something a lot more dynamic, something I’d have a lot more control over and more ability to make truly my own. Something a lot like how prison architect is how I’d envision it. You would designate specific areas / buildings to certain functions, so for example, you’d mark one building off as a restaurant and another as a souvenir shop. Then, based on what you designated it, each type has requirements to be functional. So a restaurant might require at least 4 tables, chairs, a kitchen, and server station or whatever. Likewise, the souvenir shop might require a checkout line, 4 product stands, etc. Just my opinion but setting these up would be a lot more fun and would add an additional management level to the game, where you’d have to keep an eye on things like as your park gets more popular, the restaurants might get more crowded and thus require more tables. To the ears this game is already a masterpiece. While the graphics left my jaw on the floor, the sound had me blown away. Crowds of people sound extremely good – it sounds like you’re really there. Ride sounds are even better, from the clicking of the chain lift or the brakes on a roller coaster, to stationary ride sound effects like sirens and air pressure releases, it is insanely immersive. I can’t wait to see this expanded further as well. If this game were finished, I’d rate the controls as pretty sub par. Not terrible but not ideal either. One of my main gripes is camera control. Others may be used to it, and it probably is just a thing with me but the controls for rotation, by clicking the middle mouse button, is odd for me and I don’t like it. There are some settings to change what the right button hold does, but I’ve been unable to make that rotate. Currently it just slides the camera based on a few things (you can select it to slide based on the clicked location, or slide in general). I want to be able to rotate with the RMB and it’s a bit annoying. Also the default camera for building things like paths is set to center each time you build a new piece, so if you zoom out and pan a little, then build a segment, it zooms back in and pans back to center. Thankfully this is easily changed but it’s a very odd camera. They’ve included the ability to free roam as a camera view, which is perfect. To be able to see all sorts of eye-lines and really see your park from every perspective is what I’d hope for. UI is above average. It is sleek and user-friendly but could do for some upgrades as far as selection and sorting. There’s not a ton of items in there though, so it may be that there’s not enough to really showcase what it can do. So I won’t go any further into that for now, especially considering that I’d expect to see improvement. Immersion is tremendous. As mentioned, a free roam camera will allow you to see your park from every angle, and viewing the rides from the rider camera makes for quite the experience. It’s something else to be able to jump onto your own roller coaster and watch every crest, drop and turn. Oculus support is hopeful but not implemented yet, which should make this game incredibly immersive. Challenge really is non-existant, as the game is simply a sandbox at this point with no pricing, funds, R&D, etc. Still it’s very easy to challenge yourself through builds and such for now. It seems that while modding support hasn’t been a primary concern for Frontier at this time, community integration in phase three of development will feature the ability to share, download and build other player’s creations. While not exactly the same, it’s a step in the right direction. Frontier’s RCT 3 was given life well beyond it’s few expansions thanks to mod support and a great community and if this doesn’t have the same I will be let down. The opportunities are limitless, with new maps, expanded rides and coasters, to more themed scenery and stalls. Frontier essentially said they’ve looked into doing it, but haven’t promised anything, so I wouldn’t expect anything less than how Bethesda handled their creation (mod) kit, by releasing it several month’s after the game’s release. Either way, to go without mod support entirely is a huge mistake, one that the infamous Sim City made that Cities: Skylines capitlized on in a big way. Fan-made content in maps, buildings, landmarks, architectural-styles, interchanges, not to mention gameplay teaks all contributed to Cities’ success tremendously. There’s quite a parallel I’ve drawn here, that I see plain as day, between the famous city-building game franchise and the famous roller coaster tycoon-building franchise. Each had it’s own distinct throne, held by a reigning king for years, with multiple titles that further cemented the king’s rule over other similar games. Sim City held the title since the early ninties, while roller coaster tycoon, while developed by various studios firmly grasped it’s rule since 1999. Both had a significant gap between their last title and their most recent one. Sim City 4 hit in 2003, while RCT 3 hit 2004. You’ll notice in this case I’m ignoring smaller-project spinoffs and titles, like RCT 4 Mobile. This gap in time, for almost a decade for both series, created cracks in the foundation of their castles, casting doubt and allowing pretenders to rise. And rise they did. Finally in 2012 Sim City (5) was announced, a reboot of the series intended to bring a fresh game to the series to again assert it’s dominance. But due to a number of issues that plagued the game, from small cities, always-online DRM requirements, bugs, horrid launch, and more, the game completely failed to claim the throne of City Simulator. In came Cities: Skylines from Paradox; Sim City basically as it should’ve been. Better promises, better development, complete mod and steam workshop support, it was a phenomenal success, stealing away the crown. 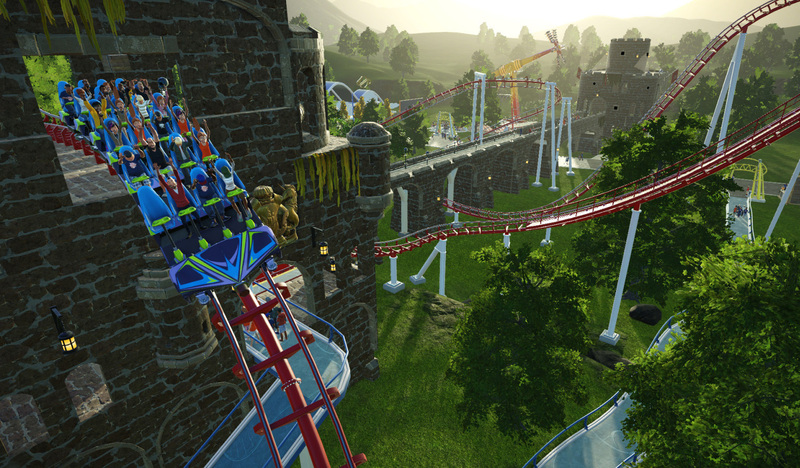 Likewise, here we have RCT 3, which was actually developed by the same developers as Planet Coaster (so small wonder the hype for this game), that had not had a true successor until the announcement of RCT World in late 2014. But over it’s “development” cycle, it incurred numerous issues, switching developers three times. Now, after a promised release of late 2015, they set it back to an early access stage for May. Gameplay footage has been shown to be buggy and downright bad, graphics aren’t good and they insist on no mod support. When will these developers learn that modding is an extremely important facet to a game’s lifespan and sales? Needless to say, with Planet Coaster already in EA and poised to claim the throne, we’ll find out later this year if the throne has been usurped and two reigning dynasty franchises have been toppled.